Dr. Ward is a 1992 graduate of the University of Georgia and founder of The Association for Pet Obesity Prevention and author of 'Chow Hounds: Why Our Dogs Are Getting Fatter-A Vet's Plan to Save Their Lives.' He has authored over 100 veterinary journal articles, texts, and training videos. He is a popular lecturer, was voted &quot;Speaker of the Year&quot; for the North American Veterinary Conference, and was the resident veterinarian for the 'Rachael Ray Show.' from 2007-14. 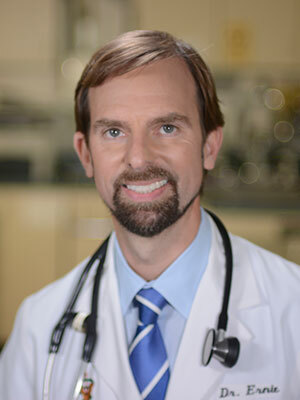 Dr. Ward has been a spokesman for the profession on Animal Planet, CNN, 'NBC Nightly News,' 'Today,' &quot;Good Morning America,&quot; and 'Nightline.' He owns E3 Management consulting firm and is the founder of Seaside Animal Care, a National Practice of Excellence Award winning small animal hospital. Ernie Ward, vibrant speaker and personal wellness expert, shares tips from his experiences owning a practice with team wellness as a core value.